The Keys to Cheese: Does This Cheese Melt? Whether you are making cheese fries, grilled cheese sandwiches, quesadillas, baked cheese bites, or homemade mac and cheese, choosing the right type of cheese can make or break these comfort foods. The key to all of these dishes is cheese that produces an even and homogenous melt. Cheeses like Cheddar, Mozzarella, and Gruyere are used often. If you aren’t feeling adventurous, you could just memorize the names of these greatest hits. However, if you want to experiment and change the melty cheese game, you’re going to have to understand why these cheeses work. 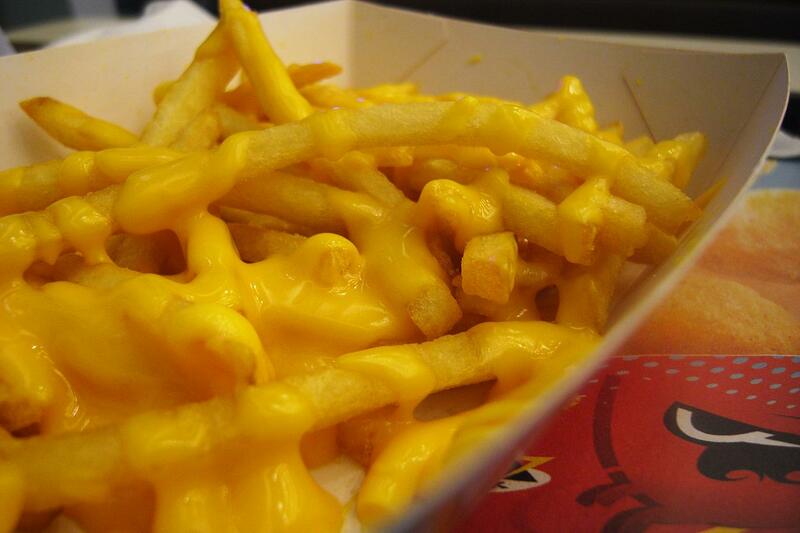 Let’s first examine what happens to cheese as it melts. The interactions of casein (milk proteins) and calcium help define its solid structure. When solid, caseins are bound together in large branching porous protein networks that entrap milkfat and water. Calcium (as calcium phosphate) acts as a bridge to stabilize these networks. When you apply heat to a cheese, melting occurs in two stages. First, at around 90 ˚F, milkfat is released1. This is because hydrophobic (water-repulsive) interactions between casein molecules increase under heat2. These interactions force out water molecules and the space between casein molecules increases allowing milkfat, which melts at this temperature, to escape. If you’ve put cheese on a burger that’s being grilled, you may see little sweat beads of liquid form on the cheese in the early stages of melting. The second stage happens at about 40 to 90 degrees higher, at around 130 – 180˚F3. At this point, the casein proteins do not break down, but rather, the increased movement of the proteins, resulting from the heat, allows for the proteins to act more fluid-like and the cheese melts. There are many factors that control melting and explain why melting temperatures vary by as much as 50 degrees. No one factor defines a cheese’s melting properties as these factors can interact. Cheese with higher moisture and fat content tends to have lower melting points. For example, high moisture cheeses like Mozzarella melt around 130 ˚F and low moisture cheeses like Swiss melt at 150 ˚F 2. First, as previously highlighted, the milkfat and water portion of the cheese react to heat at lower temperatures than the proteins. Accordingly, with more moisture and fat present in a cheese, greater proportions of the cheese are susceptible to melting at lower temperatures. When the fat becomes liquid, it can no long provide support for the protein networks. Secondly, increased moisture and fat means that the casein proteins are more spread out and the mesh size (gap between proteins) is larger. This means there are fewer connections (bound calcium bridges) between proteins networks making melting more likely to occur at lower temperatures. You may not know the exact moisture and fat content of every cheese variety without looking at a label, but intuitively, softer cheeses have more moisture and fat. Additionally, younger cheeses generally have more moisture so they also tend to melt more uniformly and evenly. Chesses typically melt homogenously and evenly around a pH of 5.0 – 5.44. This is related to the calcium bridges. At too high a pH (pH > 6), too much calcium is present as bound calcium phosphate and the protein is too tightly bound to melt. With lowered pH, the calcium phosphate bound to the casein is replaced by hydrogen (H+), allowing for more movement among proteins.2 At around a pH of 5.0 – 5.4, there is a sufficient number of calcium present as bridges to allow for melting. At too low a pH (pH < 4.6), too many calcium bridges are lost and proteins aggregate and are unable to flow and melt evenly. Lastly as a caveat, the factors being highlighted are specific to rennet-set cheeses, and not acid-set cheeses. Acid-set cheeses like queso fresco, paneer, and ricotta are not generally used, as they don’t produce even melts4. This results from the way they were made. In cheese making, you have two options for separating the solid curds (primarily casein proteins) and the liquid whey; Use rennet (an enzyme derived from the intestines or baby goats and cows) or use an acid (like vinegar or lemon juice). When they are free floating in liquid milk, casein proteins have a slightly different molecular structure than when they are in cheese. In milk, caseins stick together in small clusters (micelles) that have negative charges on their surface. Since negative charges repel each other, these micelles won’t combine. Adding acid to heated milk lowers the pH, which neutralizes the negative charges on the micelles; therefore the casein micelles can aggregate. In contrast, using rennet to set cheese is a more targeted approach. In this process, an enzyme contained in rennet called chymosin, selectively removes negatively charged portions of the casein micelles and allows the micelles to clump. In an acid-set cheese, calcium bridges are never formed as a result of the acidic environment used to generate the cheese5. These cheeses are only held together in protein aggregates rather than protein networks with calcium bridges and don’t produce the even melt desired. Rennet-set cheeses with high moisture and fat are the best cheeses for melting as they melt evenly and consistently. But don’t fret if you still want to harness the flavor of other cheeses (especially older or drier cheeses)! You have options: Try using a cheese blend with a higher proportion of the better melting cheeses and a small proportion of the other cheeses. For example, this recipe uses a 1:4 ratio. Experiment! You now know the keys for melty cheese! Mcgee, Harold. On Food and Cooking. 2004 “Cheese” (57 – 67). Tunick, Michael. The Science of Cheese. 2013 “Stretched Curd Cheeses, Alcohols, and Melting” (82 – 91). About the author: Vince Reyes earned his Ph.D. in Environmental Engineering at UCLA. Vince loves to explore the deliciousness of all things edible. Grant Alkin https://sites.lifesci.ucla.edu/ibp-scienceandfoodnew/wp-content/uploads/sites/123/2016/09/newlogoSm-2-300x31.png Grant Alkin2015-10-13 10:00:002015-10-13 10:00:00The Keys to Cheese: Does This Cheese Melt? Grant Alkin https://sites.lifesci.ucla.edu/ibp-scienceandfoodnew/wp-content/uploads/sites/123/2016/09/newlogoSm-2-300x31.png Grant Alkin2015-06-04 10:00:082015-06-04 10:00:08Cheese Holes & "Imaginary Meals"
Given the popularity of cheese and the seeming ubiquitous goal towards eating less fat, it is no surprise that reduced- and low-fat cheeses have great market potential. Though as many cheese companies have discovered, reducing the amount of fat for the sake of fewer calories sacrifices that rich, bold, creamy flavor of cheese. Fat is a major contributor to taste and mouthfeel of foods, and many cheeses are considered high-fat foods. But how exactly does fat content influence cheese taste and texture? In cheesemaking, the process of converting milk to cheese alters the structure and composition of milk, essentially reducing it to a concentrated form of milk fat and casein, a major milk protein. Casein forms a protein matrix that traps fat and water, giving cheese that soft, moist texture we expect . Full-fat cheeses typically have a casein-to-fat ratio of less than one, meaning there is a higher concentration of fat compared to casein in the cheese. Because fat is a nonpolar biomolecule, the greater fat content, locked within the casein network, gives rise to a predominantly nonpolar cheese matrix. By definition, reduced-fat cheeses have at least 25% less fat than their full-fat counterparts and low-fat cheeses have 3g of fat or less per serving (21 Code of Federal Regulations [101.62b]), which is roughly around an 80% reduction or greater, depending on the type of cheese. To accomplish this, lower fat milks, such as skim milk, are used to produce the lower fat variants, which have a casein-to-fat ratio greater than one [1,2]. With less fat, the casein networks form a tighter matrix that gives rise to firmer cheese . To replace the fats removed from the cheese matrix and to soften the texture, water is typically added back into the cheeses . Water is a polar molecule, so by increasing the moisture this way, the cheese matrices of reduced- and low-fat cheeses are more polar, unlike the nonpolar matrices of the full-fat cheeses. Comparing the casein-to-fat ratios of different cheeses gives insight into more than simply cheese composition—the ratios signify how we taste the cheese. When a piece of cheese is ingested, it increases in temperature in our mouth and dissolves with saliva, transforming from a semisolid to a liquid. In addition to textural changes, aromatic flavor compounds are also released during this phase change . The rate at which these compounds are released is determined by their partition coefficient, which is the concentration of the aromatic compound in its gas form compared to its concentration in its liquid form . Whether the flavor compound is in a polar versus a nonpolar matrix can influence the partition coefficient, altering the timing of their release and ultimately, our sensory perception of the flavor . Many flavor compounds found in cheeses happen to be fat-soluble, meaning they can mix with other nonpolar substances without separating into two layers. Considering that lower fat cheeses have prevalently polar matrices, the way the flavor compounds interact with the cheese matrices differs significantly enough to change flavor-release patterns. This is what causes some reduced- and low-fat cheeses to taste “off” compared to full-fat cheeses. Fat reduction also modifies the cheese biochemistry. Through analysis of full-fat cheese versus 75% reduced-fat cheese, it was found that different sets of flavor compounds are critical for the cheesy flavor of the two types of cheese . 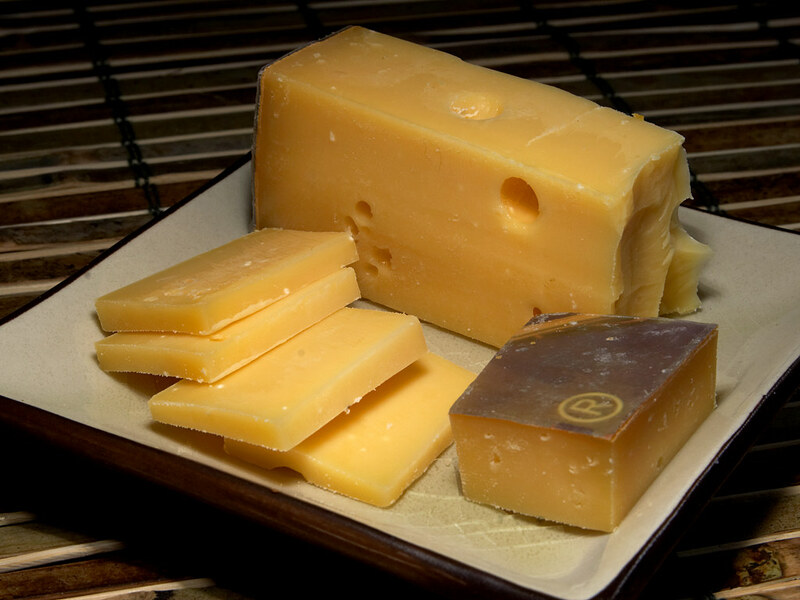 When certain flavor compounds characteristic of full-fat aged cheddar were added to reduced-fat young cheddar, tasters scored the two cheeses similarly . So take heart, cheese-lovers. Reduced-fat cheeses certainly do have the potential to be healthy and delicious. Dan Drake is the owner of Drake Family Farms in Southern California. 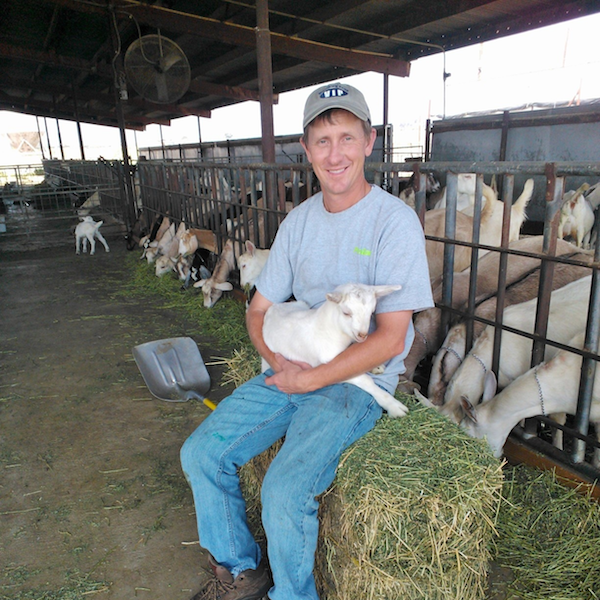 As a veterinarian, Dan has been overseeing the health of the Drake Family Farms goat herd for the past 26 years. Using quality milk from their goats, Drake Family Farms produces farmstead and artisan cheeses that are sold locally throughout Southern California. What hooked you on farming? I grew up on a farm and love working with the animals. I named my animals and made them part of my family. I am especially addicted to raising goats, and so I started a cheese company so I could justify keeping my goats. It is a ridiculous idea, and over the past three years it has been a financial disaster. But that is what farming is, a labor of love and bad finances. Farmers are victims of “Stockholm syndrome” with the far as the captor. 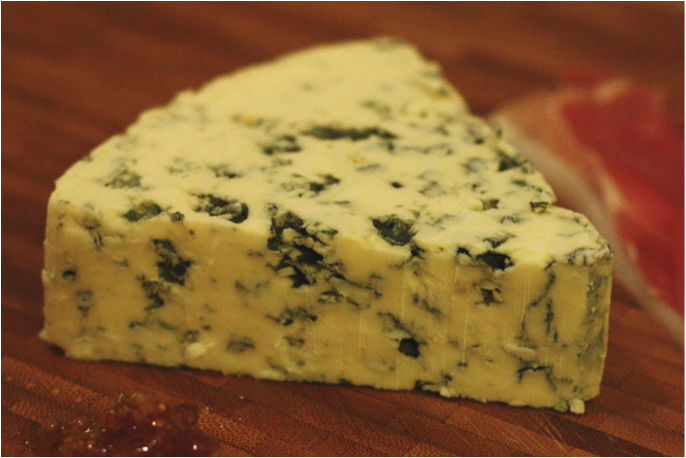 The mold-ripened cheese: as it ages and ripens it becomes more delicious. 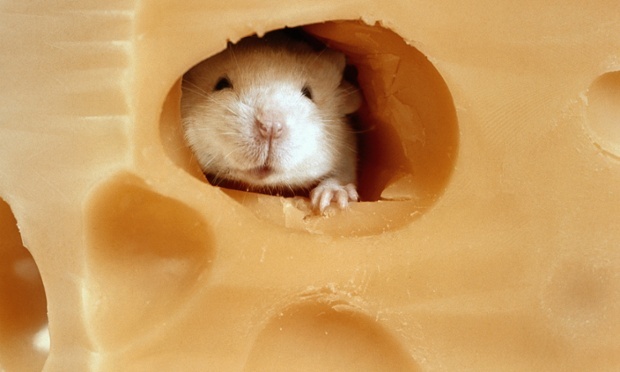 Cheese, of course, is the most fascinating food on the planet. I find it amazing that you can make so many varieties from the same milk. What scientific concept—food related or otherwise—do you find most fascinating? A farm filled with healthy, happy goats produces delicious, high-quality milk that makes the very best cheese—cheese that is unparalleled in quality and flavor. It is all about the goat biological system and how healthy the goats are. People think it is just good karma coming through in the cheese, which it probably is, but you can see the science of population health and productivity all the way through the process. I believe all of our cheese is superior because we start with superior quality milk. Without healthy goats, the milk would not produce superior quality cheese. It all goes back to the quality of the starting ingredients: in our case, the milk. You can’t fix damaged milk. You have to start over again with better milk. I am hopeful that science will help us to become more efficient in producing the crops we feed our goats, and therefore our cheese production will become more efficient. They say we have to feed 9 billion people on this planet in the coming years. We won’t be able to do it with our current farming methods. Hopefully these new technologies and scientific discoveries will also help us to work better with our environment and preserve our planet at the same time. I believe it can and will be done, we just need some smart scientists to figure it out AND we need the public to accept the discoveries they make. Cheese. You can add it to anything and it always tastes better with cheese. My Grandma Drake’s hand-written recipes. My favorite: an omelet with a lot of cheese and meats, a fresh baked tomato with pepper, sourdough toast with lots of real butter and strawberry jam, fresh-squeezed orange juice. My reality on-the-go: a quesadilla and a Dr. Pepper while driving down the freeway to work. 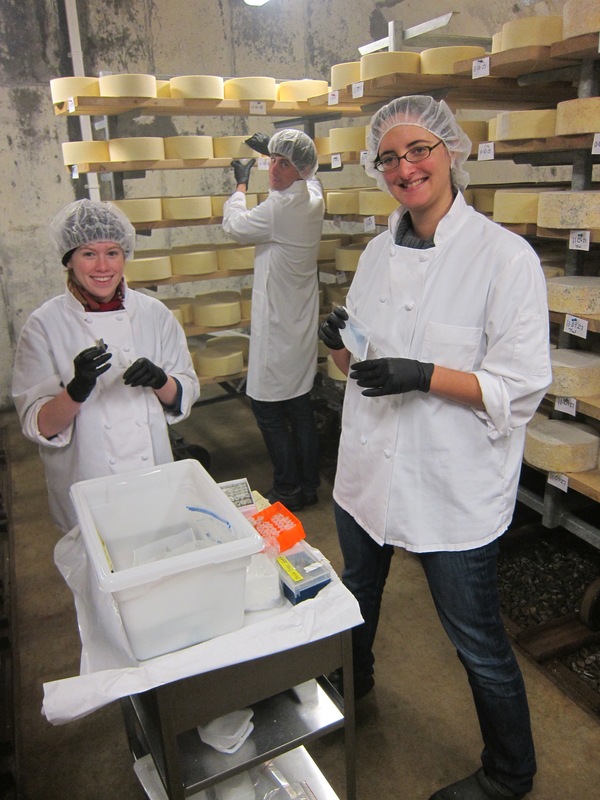 Rachel Dutton is a Bauer fellow at Harvard University where she uses cheese to study microbial ecosystems. 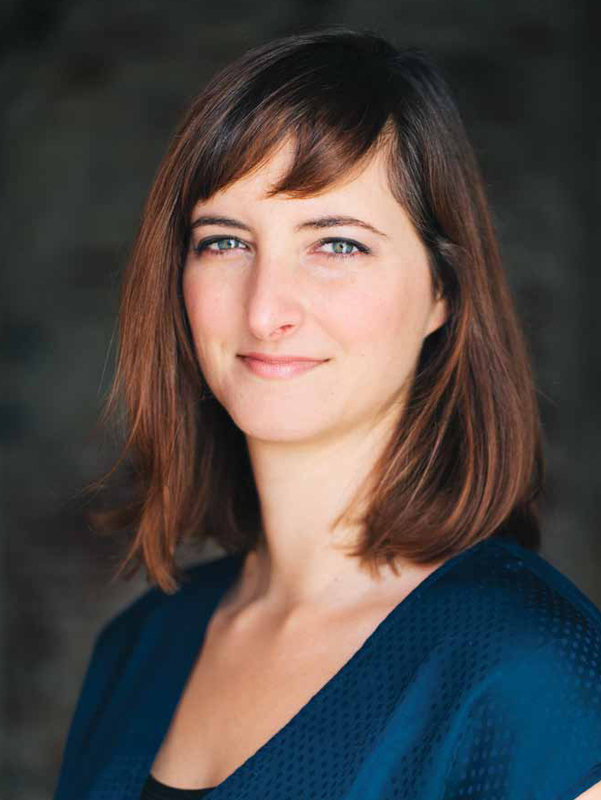 She has collaborated with chefs David Chang and Dan Felder of Momofuku, and her research has been featured in Lucky Peach Magazine, The Boston Globe, NPR, The New York Times, and on the PBS TV series Mind of a Chef. What hooked you on science? I blame microbes for hooking me on science. I am just completely amazed at how versatile and powerful they are—and we can’t even see them! 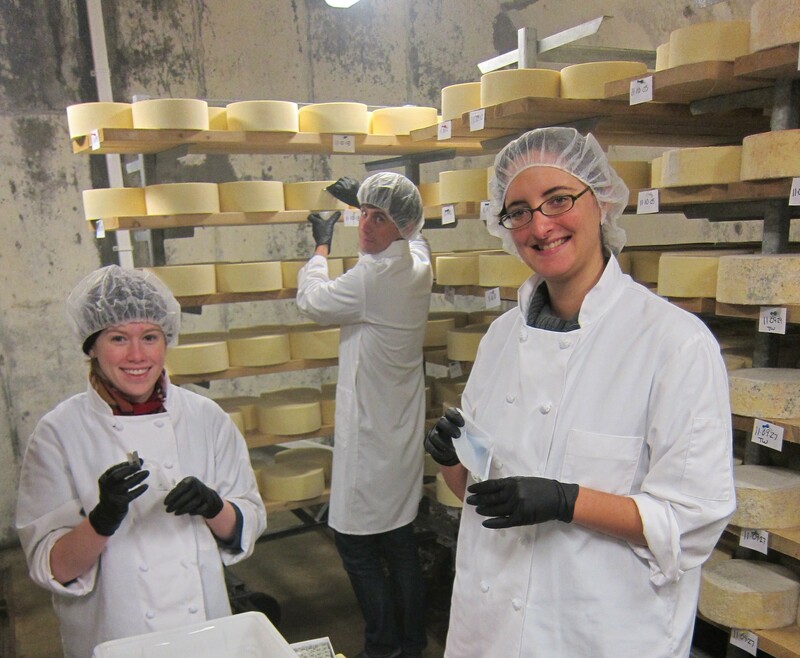 My lab studies how microbes form communities in cheese. I think the coolest thing is that these microbes are doing everything from fighting to sending out chemical messages, and all this is happening as we eat a piece of cheese. I guess I am biased, but I think cheese is absolutely fascinating. I started out thinking that cheese was this relatively simple thing, but the more I work with it the more respect and awe I have of how complex and nuanced it can be. Both in terms of the flavor and the science. It is also incredibly interesting from the perspective of its history and cultural significance, and there are so many passionate people working with cheese. I think the most fascinating food related concept right now is that microbes could be used as new sources of flavor in foods. Much of the flavor we currently have in fermented foods comes from the microbes themselves. And we know that microbes have an incredible diversity of metabolic pathways, so what if we found microbes that could ferment foods to give it totally new properties? The way that we identify species of microbes by sequencing their DNA can be a tricky concept. I like to compare it to matching fingerprints in a database, like in CSI, except that the fingerprints microbes have are unique sequences in their DNA. I think I use both cooking and science to explore and learn. 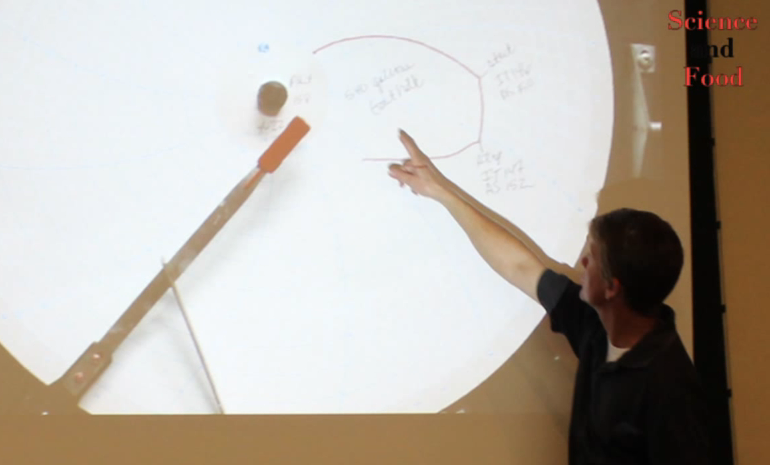 In the lab, I use science as a way to learn more about the way microbes behave. In the kitchen, I like to cook things that allow me to explore new cultures or ingredients. I use a scale a lot. Even when I don’t need to, sometimes I’m just curious how much something weighs. Whole milk yogurt, lemons or limes, maple syrup, mayonnaise, and ginger. I think steamed clams are my favorite food, and fermented black soybeans are a favorite ingredient. I’m also a sucker for anything with cardamom in it. When I have time on the weekends, sometimes I’ll cook from Rick Bayless’ Mexican Kitchen. I grew up in California and studied for a while in Mexico, and I love Mexican food and culture, especially from central and southern Mexico. The other cookbook I’m really enjoying right now is Yotam Ottolenghi’s Plenty. I usually rotate between yogurt with honey and granola, oatmeal with maple syrup and walnuts, and eggs on toast. Have you ever been offered a fancy cheese that smelled more like a used gym sock than something edible? Odor artist Sissel Tolaas and researcher Christina Agapakis took this idea and ran with it, with their project Synthetic Aesthetics. The duo used bacteria isolated from human hands, feet, noses, and armpits to generate cheese! Many cheeses, like beer, wine, and yogurt, are the product of fermentation. Fermentation occurs when microorganisms such as yeast and bacteria convert carbohydrates such as sugar into alcohols, gasses, and acids to generate energy in the absence of oxygen. One common cheese-making type of bacterium, Lactobacillus, breaks down lactose, the primary milk sugar, to lactic acid. This results in lowering the pH of the milk, which as pointed out in a previous post, causes coagulation and solidification into cheese. 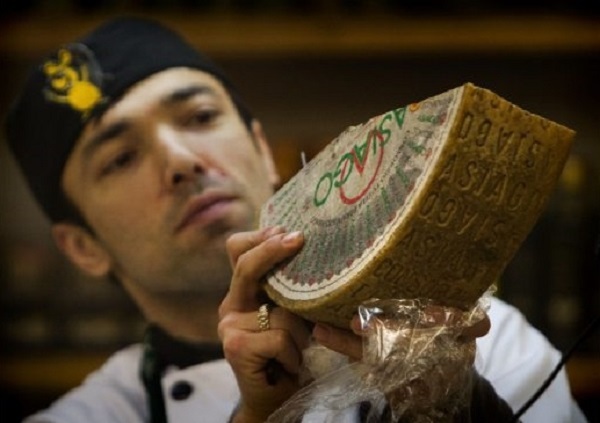 The work of microorganisms in cheese also results in the creation of many other byproducts that give cheeses their unique smell, texture, and flavor profiles. 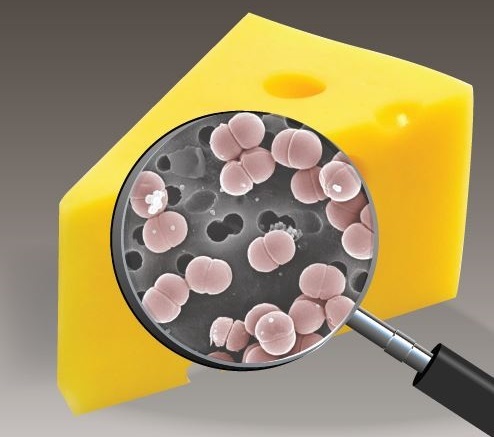 For example, the bacterium, Propionibacterium freudenreichii, generates carbon dioxide gas in the process of making swiss cheese and causes its characteristic holes . Penicillium roqueforti, which is related to the fungus that helps produce the antibiotic, penicillin, gives blue cheese it’s distinct aroma and look . Microorganisms that use fermentation are found everywhere. Tolaas and Agapakis realized that the human body shared many characteristics with the environments for creating cheese. On a hot day or before a hot date, your armpits may be just as warm and moist as an industrial cheese incubator. Furthermore, cheese-making bacteria like Lactobacillus are common inhabitants in the mammalian gut . With this information, they isolated bacteria from hands, feet, noses, and armpits and added them to whole milk to serve as starter cultures. Figure 1. 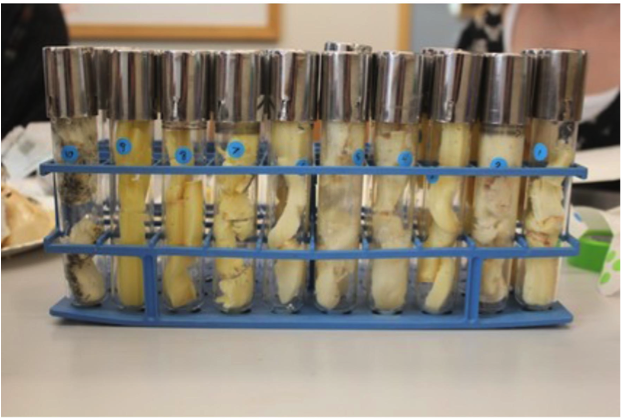 (A) Swabs from various human body parts incubating in raw milk. (B) Cheeses after solidifying. While no cheeses were consumed, they were evaluated with an odor survey and by DNA sequencing to identify the bacteria cultures present in each cheese. Figure 2. Samples prepped for the smell survey. Participants of the survey were asked to smell the samples and provide a description of the odors they detected. The cheeses displayed a diverse range of bacterial species and odors. Interestingly while some cheeses smelled like “old subway station” or “cat feet,” others exuded the familiar & appetizing flavors of “yogurt,” “feta cheese,” and “light perfume.” Furthermore, some of the bacteria isolated were common to various cheeses. For example, Enterococcus faecalis is a lactic acid bacterium found in raw milk and cheeses, like farmhouse cheddar varieties . Proteus mirabilis is related to Proteus vulgaris, which is responsible for giving surface-ripened cheeses like Limburger and Munster a strong aroma . In the face of diminishing resources, we are reminded that untapped reservoirs, which may be literally under our noses, might contain hidden treasures that could change the way we generate and produce food. Gelsomino. R. et al. 2002. Sources of Enterococci in Farmhouse Raw-Milk Cheese. Applied and Environmental Microbiology 68(7): 3560-3565. Deetae. P. et al. 2009. Effects of Proteus vulgaris growth on the establishment of a cheese microbial community and on the production of volatile aroma compounds in a model cheese. Journal of Applied Microbiology 107(4):1404-1413.